Are you enjoying your summer so far? Here on the East Coast we make the best of our short summer season with visits to the ocean. 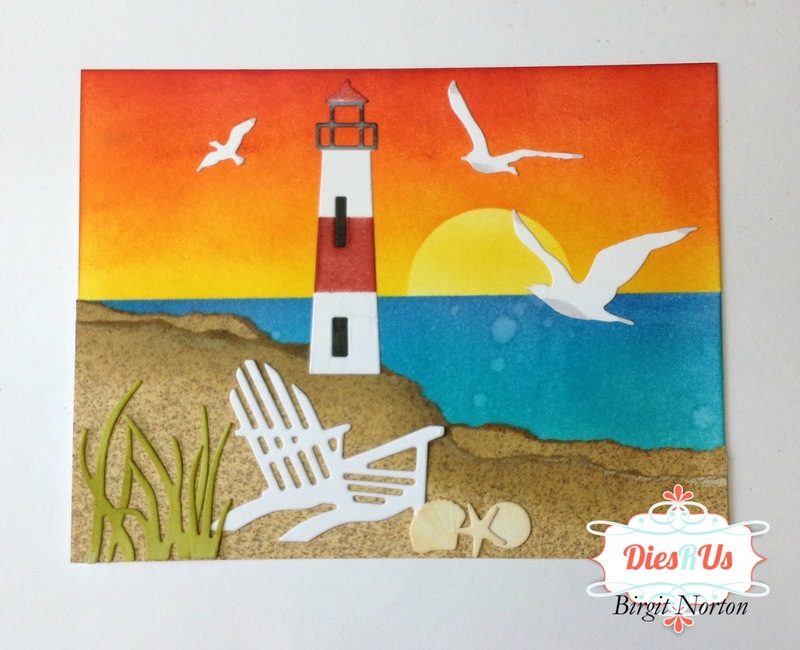 Birgit here with you today! I love the feeling of my feet sitting in the warm sand at the beach and listening to the waves as they roll in and out. 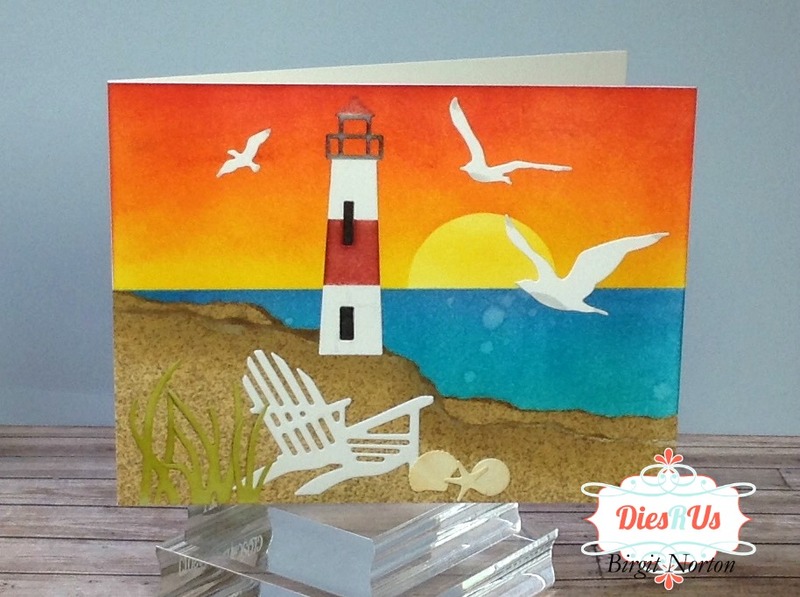 Today's card is inspired by sitting and watching the sunset at the beach. 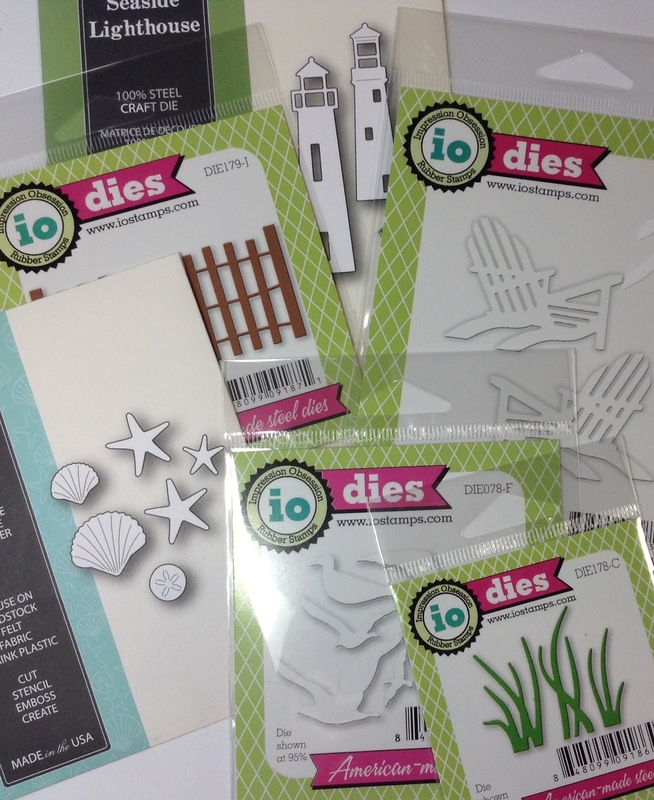 Here's a quick glimpse at the dies I used to create this scenic card. I started by creating a simple sunset background using Distress inks and then spritzing the ocean with a bit of water. 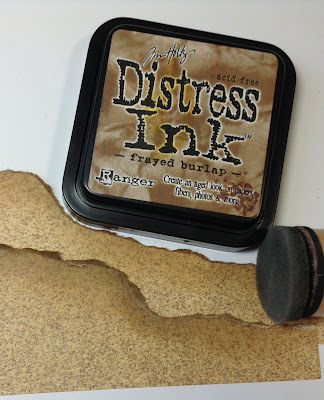 I ripped some printed paper that looked like sand and added some Frayed Burlap Distress Ink to the edges and then layered them. I cut the Poppystamps Seaside Lighthouses out of white cardstock as well as the Memory Box Seaside Treasures, Impression Obsession Sea Birds and Impression Obsession Beach Chairs. 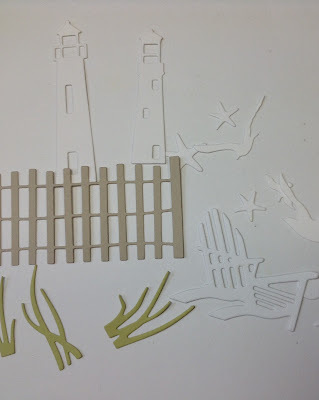 I also cut an Impression Obsession Beach Fence out of kraft cardstock and Impression Obsession Small Grass out of olive green cardstock. I added color to some of the dies using distress inks. I tried a couple different layouts. 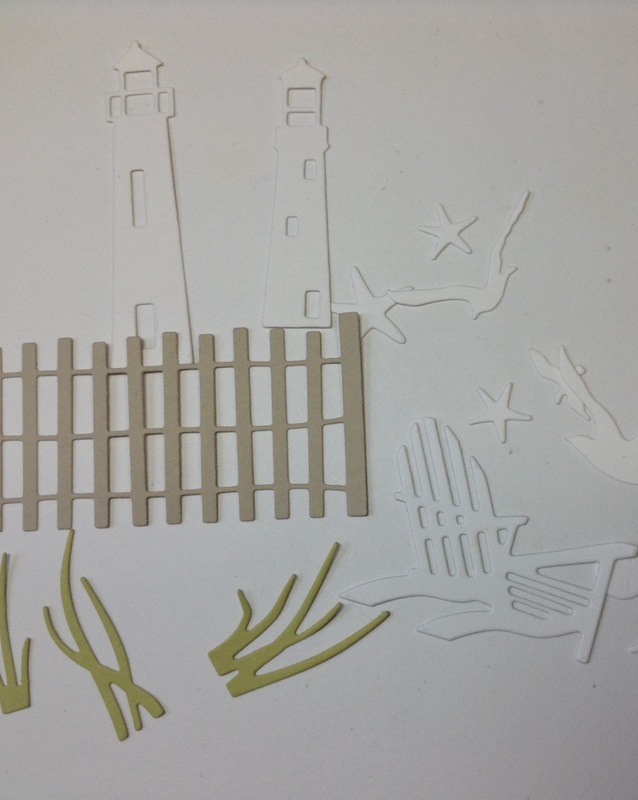 One including the fence and one without. Which one do you like better? For the sake of finishing this post, I asked my daughter and she said she liked the one without the fence because it was less busy. I guess "less is more" in this case so this was the final outcome. Items come in and out of the store very quickly, so if any of these items are currently out of stock, simply click the button that says "Put me on the waiting list" and you'll be notified by e-mail as soon as they arrive. 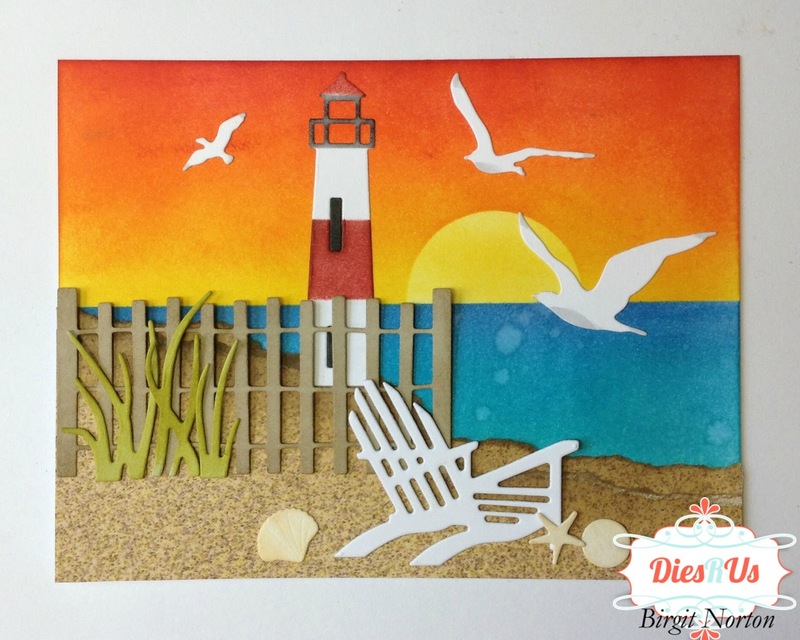 What fabulous beach scene creations Birgit! I love them both but I actually think the one with the fence is my favorite lol. Awesome inspiration using this combination of dies. Well done! 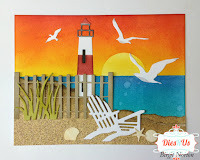 What a fun beach scene using some of my favorite dies! such a gorgeous scene! 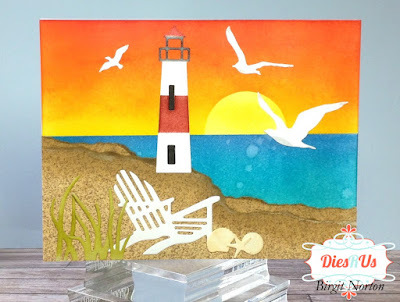 you really rocked this card! 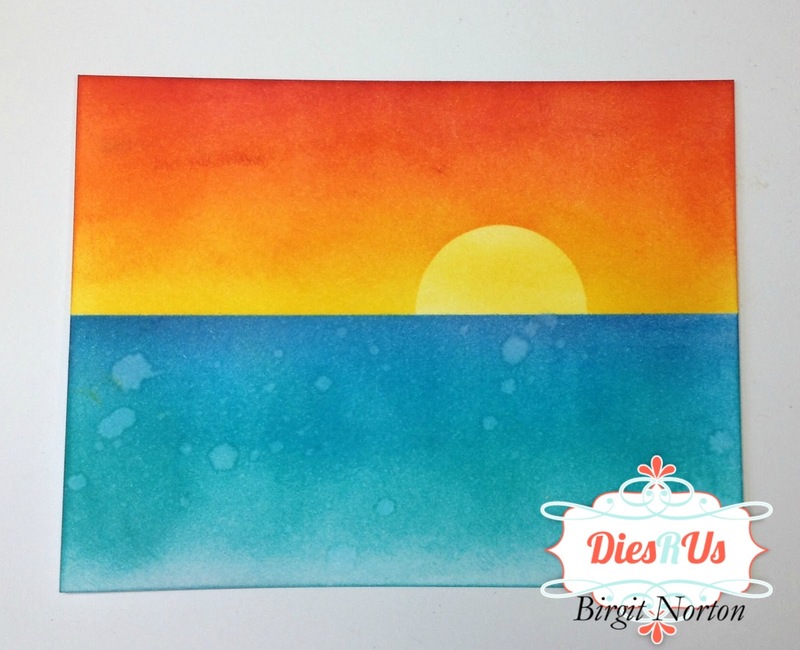 Wow, Birgit! 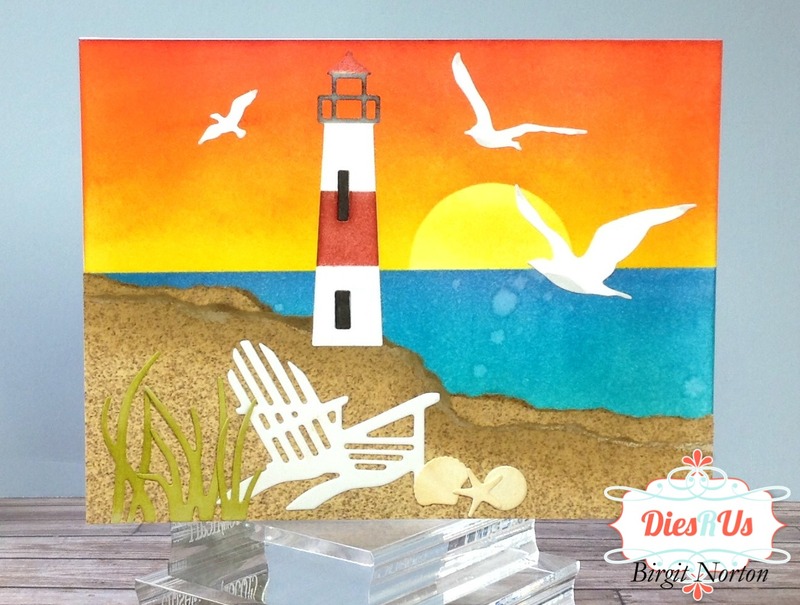 I love the vibrant colors in the background of your beach scene. Beautiful! I want to go there now.